In order to determine an ideal caloric deficit, you need to determine your goals. Maybe, you have a lot of fat to lose and that is your only goal, for now. Maybe you want to lose fat without losing muscle. Or maybe you want to lose fat while also gaining muscle, which can be done, especially if you are new to strength training. I’m going to break-down my recommendations for using your BMR to determine how many calories you should eat to maintain a healthy, productive deficit. These calculations have worked for me over the past few years, and they WILL work for you. There are roughly between 3400 and 3700 calories in 1 lb of fat mass. Conventional wisdom tells us that 3500 calories is a solid estimate. There is research to dispute that number, because fat loss is not a linear process. (The more weight you lose, the harder it is to lose weight… we’ll describe why that happens in a second.) But, you need to start your calculations somewhere, and this is a great place to start, especially if you have a lot of fat to lose. Use these numbers–they work–and adjust as needed as you progress. As discussed, you need to maintain a caloric deficit to lose weight. If there are 3500 calories in a pound of fat, and your goal is to burn that pound of fat off your body (either through exercise or just by being alive) you need to accumulate a deficit of 3500 calories. How you spread that deficit out over the course of weeks determines how quickly you will lose fat, as well as how able you are to hold onto (or gain) muscle. Your body is DESIGNED to survive for as long as it can without food. As a way to protect itself from death, your body “slows down” by avoiding bodily functions that are superfluous, and your metabolism slows down so that you can store whatever small amount of food you are getting. That’s right, the less you eat, the harder it is to lose weight over time. No matter your goal, you must ALWAYS eat at or above your BMR. You never want your total caloric intake to be less than your BMR. If your BMR is 1500 calories, you should never eat less than 1500 calories in a day. If you do—regardless of how much fat you have to lose—you encourage adaptive thermogenesis. This is especially important if you are fighting to lose that last 10lbs of fat. SO DON’T DO IT! THAT INCLUDES EXCESSIVE CARDIO EXERCISE. Creating too large of a caloric deficit through cardio exercise is the same thing as starving your body by not eating. While it is great to employ a little bit of cardio to help augment your deficit, you should never do so much cardio that your deficit puts you below your BMR. If you do, you are starving yourself, slowing your metabolism, and preventing muscle growth. If you think running on the treadmill for two hours a day with moderate “dieting” is going to help you get in shape, you are wrong. Same for the elliptical, that Cardio-barre class, the TRX thing, etc. Do not starve yourself with extreme dieting or extreme exercise. I’ve lost the bulk of my last ten pounds with very little cardiovascular exercise. Like, 10 to 20 minutes of HIIT, 3 or 4 times a week, and a few long walks per week. Don’t believe the hype about cardio, especially what they are selling in bootcamps or crossfit gyms. It will work for some people, of course, but it’s not easy and not everyone is built to flip a giant tire across a parking lot! Plus, if you get injured, you’ve sabotaged your entire plan and you sacrifice the gains you’d make going slowly. In order to change your body in a way that will last, you need a consistent caloric deficit that doesn’t starve your system. You have to go slowly, methodically, and commit yourself to the small, permanent lifestyle changes you are making. You have to train your body to use food for fuel, and then it will burn fat like a machine. You need a manageable, consistent deficit that you can stick to easily for weeks or months. If you eat fewer calories than your BMR, or burn calories to put your total below your BMR, your body goes into starvation mode. Even if you are “losing weight,” your body is trying to do everything it can to hold onto that weight for later, and at a certain point your body will win. As soon as you start eating again, you will gain the weight back. Fight the temptation to crash diet in an effort to game the system and get quick results. If you maintain a small, consistent caloric deficit YOU WILL BURN THAT FAT OFF YOUR BODY. And it’s much easier than running on a treadmill for two hours. I cannot believe what happened to my body in just about 3 months of really monitoring my caloric intake. In comparison to years of failed attempts, 3 months is NOTHING, and the results will last for the rest of your life if you want them to. If you want to make this change, it’s very easy. You have to want to fix the way you eat and exercise, and make it a permanent choice… not a “diet.” Anything anyone else is telling you is just a gimmick to sell you something. First step: You need to calculate your BMR. All equations like this involve a little bit of speculation, and that’s okay. I believe the most accurate “at home” BMR assessment is the Katch-McArdle formula. This formula incorporates your current body composition as a means of estimating your BMR. That’s more accurate than using your height/weight, because not all heights/weights are created equally. Lean mass burns more calories at rest than fatty mass, so knowing your current body fat percentage now is important to determining how many calories you burn as a baseline, without any activity. I’d recommend a DXA scan as the best, most reliable option for determining your body composition. I know a DXA scan is not available to everyone, so use a caliper test or a bioimpedance scale to determine your body fat. These won’t be as accurate as a DXA, but there will be a certain amount of testing in the beginning, in order to find your most accurate numbers. More on various types of body fat tests later… but if you don’t know how much fat you are carrying, you should figure that out before you get serious. 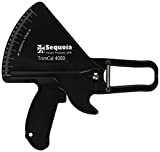 Here’s a link to some easy to use calipers. Your lean mass (muscle and bone) is your total mass minus the pounds of fat you are carrying (body fat % x Total Mass). As an example, here’s my calculation as of December of 2014, when I was in the worst shape of my life. That number, 1648, was key. Once I knew it, I knew that should always, eat AT LEAST that many calories, at a minimum. No matter what. Always. TDEE stands for Total Daily Energy Expenditure. This is an estimate of the calories you burn on average, based on your activity level. It’s the baseline number you should use for calculating your deficit. Your “activity factor” is a number based on the amount of activity you do on the regular. You need to asses your current, average level of daily activity—listed below—and then multiply your BMR by that factor. That number, my TDEE, was an estimate of the number of calories I burn every day including my job and a little bit of exercising. Once you have that number, it’s time to calculate your deficit. Here’s the fun part. You know you should never eat below your BMR because it puts you in starvation mode, but you should also tailor your deficit based on your goals. A person with 30% body fat and no experience strength training can get away with a larger deficit than the person who is at 20% body fat. The larger the deficit, the closer you get to starvation mode. Plus, the harder it will be for you to maintain consistently, and consistency is key at any level. I would not recommend more than a 30% deficit for most people. It’s difficult to maintain, and it will sabotage your muscle-building goals. If you are already healthy (let’s just say <18% body fat for men or <22% body fat for women—debate me on that later) I would not go above a 20% deficit. But forget percentages for a monent. It’s easiest for you to calculate ideal caloric deficit based on your fat loss goal (and whether that goal is healthy and sustainable). If you have a lot to lose (> 25% bf for men or >32% bf for ladies) and extreme fat loss is your number one priority, you can aim for losing 2 lbs per week. Nobody should ever try to lose more than 2 lbs per week. More than that and you are most likely in starvation mode, losing water weight or muscle mass, even in cases of extreme obesity. Based on a 3500 cal/lb of fat estimate, 2 lbs of fat is 7000 calories, so if you want to lose 2 lbs/week you need a 1000 calorie per day deficit. That’s a big chunk of calories. Remember, if a 1000 cal/day deficit puts you under your BMR, that’s too much and it will sabotage your goals. If you are already average/healthy (14 – 24% bobf for men or 21 – 31% bf for women)—and you have some experience in the gym—you might aim to lose 1 lb of fat per week. That’s 3500 calories, which means a 500 cal/day deficit. This is still a challenge, but much easier to maintain, and it’s what I’d recommend for most people who are trying to get to their “next level” of fitness. It’s what I stick to when I’m cutting fat. If you can manage to cut a pound of fat each week without losing muscle you’ll be down 8lbs of fat in two months! For an average male (165lbs with 18% body fat) that takes you to 13.8% body fat! (29.7lbs fat – 8lbs fat)/157lbs total mass You will notice a difference at that body fat percentage. (In my experience, guys notice some abdominal definition around 12% body fat). This is a great/safe deficit for most people. If you are already fit (<15% bf for men or <21% for women) and you are trying to get “ripped,” i.e. single-digit body fat—let’s just say anything less than <12% body fat—I would aim for between .5 lb and 1 lb of fat loss per week, but no more than that. I’ve found that when I “cut” more than that, I lose muscle mass. It’s easy for your body to fall into starvation mode when you are already pretty lean. Don’t starve yourself to get ripped. You will get ripped with a .5 lb per week fat loss goal, and you’ll still have your muscle when you’re done, which will make your even more ripped. .5 lb of fat is 1750 calories, or a deficit of 250 calories per day for a week. Seriously, that’s not a lot of calories. Totally doable. Skip that f’ing Pumpkin Spice Latte and get over yourself. Do you want this, or not? That’s how you lose fat. Monitor your calories diligently in MyFitnessPal. Use your TDEE to set a baseline, then subtract the daily deficit you want to employ in order to meet your goals, as long as it doesn’t drop you below your BMR. Give it two weeks. A solid two weeks, no cheating, no flubbing the numbers. If you aren’t seeing the predicted weight lose or close to it… something is wrong with your calculation. Never fear, you know how to fix it based on the above. There is a little bit of art to this, and a little bit of experimentation because everyone’s metabolism burns calories differently. But if you are consistent and TRACK YOUR CALORIC DEFICIT, you will lose the fat. NEVER eat/burn below your BMR. If you do this, YOU WILL SEE RESULTS. It’s science. Learning this stuff—and actually applying it—is what worked for me. The reason I’m writing it all down this way is to remind myself how I got here and how important it is to play by the rules.